Living in Manhattan is an incredible experience. I highly recommend that anyone who is even a little bit enamored with urban life try it at least once. Even as someone born and raised in New York City, I was struck by just how jarringly different it was to live in the heart of it. Sure there are parts of Brooklyn (the parts closest to Manhattan) that are extremely cool in their own way, especially these days, but living in the West Village in the 90’s was on a whole different level. Unfortunately it was also on a whole different level in terms of both outright cost, and “bang for the buck”. Your money really doesn’t go far in Manhattan, and even in those days, actually managing to buy something seemed an impossible proposition. And so it was that in 1997, having spent a couple of years shelling out $1500 per month for a 400 sq foot studio apartment in a lovely doorman building on the West Side Highway, we decided to make the move back to Brooklyn. My girlfriends family still owned the house she grew up in in Bay Ridge and it was a nice brick two family semi-attached. Relatives had been renting the upstairs apartment for years, but were finally moving on themselves. This left us with the opportunity to cut our rent in half, expand our space literally 500%, and most importantly (to me), gave us a two car garage. It also provided my “would eventually be” in-laws with much needed rental income continuity and alleviated their fears of having to face the prospect of renting to strangers (something which had burned them in the past). So with no small amount of sadness, we bid Manhattan a tearful goodbye and headed back across the river from whence we came. The silver lining in all of this was that it was now really obvious that it was time to car shop again! After all, we were freeing up a bunch of monthly income on rent, would be back in the burroughs where a car was actually useful, and had our own garage! It had been years, but the itch returned full force. By this point things were going pretty well career wise, and I was working at SONY as a senior network engineer in the Music division. I decided that if we were going to pick up some new wheels, it was time to do things right. And so it was that one day after work I decided to take a walk down Park Ave and found myself in Mercedes Manhattan. It’s hard to describe the feeling of being able to walk into a dealer of the caliber of a Mercedes or BMW and actually legitimately be able to buy something (at least for a car guy). To be facing the genuine realization of boyhood dreams, even if only in a small way, is something magical. I caught Mercedes in the late fall of 1997 and in the midst of a leasing event. I honestly had no clue what leasing was and thus had no built-in fear. I just looked at their offered numbers, $2500 due at signing and $389 a month for 36 months on a car that was $35,000 and thought to myself “hey! 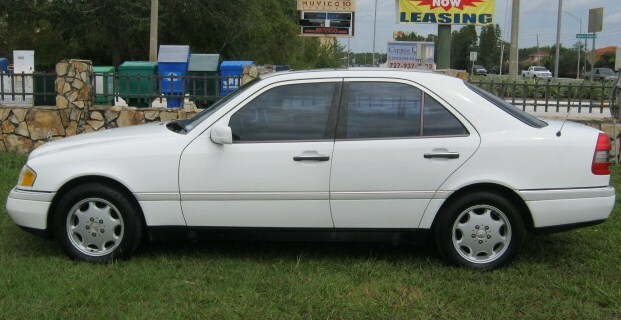 I have $2500 and $389 a month!” The sales guy, who was a genuine nice guy and absolutely not what you might fear walking into a Mercedes Benz dealer on Park Ave in Manhattan, showed me a 1997 white C230 with grey leather interior that had been used as a test drive car. It had a few miles on it so there were willing to let me drive away without the cap reduction and just the fees, first payment and security deposit. Sold! I was on cloud 9. To me that little C230 might as well have been a Ferrari 360. I felt like I had hit lotto signing on for the opportunity to pay these guys for the next 36 months! We ran through the standard paperwork gauntlet and off I went. So did the experience live up to that bar set by my sky high expectations? The W202 C Class was a really interesting successor to the tank-like W201 190E. The W201 had been Mercedes aggressive entry into the compact sedan market and was a clear sign that BMW, and it’s mighty E30 platform, was having an impact. As great as the W201 was (and it was a great car), and as much impact as it had (immortalized in pop culture by Kool Moe Dee who was Drivin, Benz 190), it wasn’t really a huge commercial success in the United States. It’s possible that Mercedes image as a staid, conservative, executive saloon manufacturer, something normally driven by a driver with a hat while “Sir” rode in the back reading the Journal, was holding back it’s acceptance as a viable alternative to the scrappy sport sedans from Bavaria. Where the W201, as great as it may have been, ultimately failed in this mission, it did lay the groundwork and pave the way for the W202. In some ways, I view the W202 as similar to the Porsche 996. It marked Mercedes reinvention as a mass market manufacturer, for better or worse. Overbuilt and under profitable, the 190E proved a concept, but didn’t provide the transformation the company needed as it moved towards the new millenium. Built to lower standards, with production distributed globally rather than centered solely in the homeland, the W202 was a true mass-market world car. The dark side of that is lowest bidder outsourcing, lower quality control standards, and razor thin engineering margins. The upside was more agility, shorter time to market, broader availability and higher profitability which, in theory, should translate to a healthier company, better designs, deeper R&D and ultimately better cars at a wider range of price points. Of course theory rarely matches reality and all of the big name Euro marques have taken some black eyes as they’ve moved towards this more Detroit approach to automotive design and production. That said, this shift has also resulted in some truly phenomenal cars, have kept these manufacturers healthy, and have kept prices (in the US at least) on a reasonable appreciation curve by and large. The C230, being one of Mercedes first efforts of the new era, turned out actually quite nicely in the real world. While less over-engineered then the 190E, the C230 was still vault solid. It had been a long while since I had enjoyed the solid thud of a teutonic door and it was certainly a welcomed sound. The cabin was similarly solid with not a creak or rattle from any panel even after 32,000 miles of tri-state area driving and all of the materials, from the switch gear plastics to the faux wood to the leather and vinyl surfaces, all felt good and wore well. The controls were logically placed, simple and straightforward. Climate control, by this point, had migrated to a basic electronic interface but the overall experience was stil quite analog in 1997. The base configuration included a nice assortment of standard equipment, including power everything and a power sunroof, as befits a Mercedes Benz. I’ve heard it said that things would eventually head south for Mercedes, especially during the Chrysler years, and that possibly they have never really recovered. The only modern Benz I have had exposure to is a late model (2010) C300 and I actually thought that was quite nice, but in any event even the diehards would agree that the W202 was at least at the very beginning of the slide. If that’s true, then perhaps it was because Mercedes was coming down from such heights that the C230 was still a very impressive “entry level” vehicle with quality in excess of its American and Japanese competition plainly evident. The overall look of the car was simple and conservative. Mercedes hadn’t yet entered its radical design years, so the C230 was an evolutionary modernization of the 190E. Nicely molded and modern bumpers and curved surfaces, and pleasing head and tail light configurations, came together to form a very clean look. Exterior quality didn’t quite hold up to interior quality, though, and the paintwork and body panel fitting failed to impress with some uneven gaps and somewhat worse than typical (even for the modern water based finishes that had become the norm) paint wear. These are fairly minor nits though. The new baby Benz was a sharp looking car that could give the E30 a run for it’s money, at least visually, and was a good value relative to it’s class. On the road, the C230 was clearly less equipped to challenge Bavaria. A sports sedan, the base C class was not. It would take the supercharged C230 Kompressor to even come close to cracking into that category, and even then I feel the chassis and suspension geometry would come up lacking. As a boulevard cruiser or highway touring machine the Benz was fantastic though. The 2.3L 4 mated to a 5 speed automatic in a RWD configuration took a good while to get moving, with 60 coming in over 10 seconds, but once up there it could cruise comfortably and uneventfully for hours. Breezing along at 85MPH+ on the highway seemed to be what the car was built for and, possibly a result of the gearing and torque curve, street starts didn’t feel nearly as anemic as the numbers would suggest. Handling was a mixed bag honestly. There was some body roll evident, but the car did feel more nimble than it’s big brothers. The suspension was firm, but definitely less capable (although more comfortable) than the E30. Steering feel was good, but noticeably more numb, again, than the BMW. The sport sedan/grand tourer/sports car spectrum is a fuzzy one and the distinctions often blur. For example the modern AMG and /// class cars seem to render the categories meaningless altogether. The C230, however, slots very clearly into the grand touring category. Ultimately it really wasn’t quite the car that could steal away loyal E30 buyers looking for that very specific compact sport sedan experience, but it would prove sufficient to win over a new category of buyer for Mercedes Benz; one that would stick around for the next 20 years as the lower end of their lineup continued to expand and evolve. For the duration of my Mercedes lease i followed the all inclusive, free maintenance schedule and ran into no break/fix issues. The car was rock solid reliable and no anomalies crept up inside or out. It’s tough to project what the long haul might ultimately have looked like from only three years of driving after having bought new and religiously following the prescriptive maintenance schedule, but I suspect the Benz would easily go into the deep six figures if properly cared for. Unfortunately over time the low end models of the high end German cars tend to fall into the hands of folks who can’t really afford to keep them up and ultimately end up in a scrap heap. It should be noted by anyone thinking to get into a Benz or BMW “on a budget”, that as these cars age and the purchase price plummets, the maintenance costs actually increase. In conclusion this was the first vehicle that I purchased truly on my own, and was also my first “high end” car. In addition it was my first lease. I can say overall that it was a fantastic experience. The Benz gave me 3 years of effortless, trouble free, commuting to Queens (at the time I had left Sony to work for Time Warner building the Road Runner consumer broadband datacenter and service for New York City in Woodside) and when the three years was up I simply drove to Ray Catena Mercedes in NJ, handed them the keys, signed once piece of paper, and left. I never owned another Mercedes (as it turns out I was quite possibly born a BMW guy), but I can say that owning this one was an absolute pleasure and one of the better memories in my automotive history.